Somewhat maniacally trying to atone for his lassitude while Hurricane Katrina ravaged the Gulf coast some weeks ago, asleep-at-the-switch George Bush has now made his eighth (and counting) visit to the area. Most recently he joined up with Habitat for Humanity, the NGO that builds houses with volunteers and what used to be called “sweat equity” in developing countries and in developed and declining countries like this one. There was George, whacking away at nails the way he likes to go at clearing brush on his ranch in Texas. In June of 1990 I crossed the border (legally) into Mexico to visit the Habitat for Humanity project in the hills beside Tijuana. 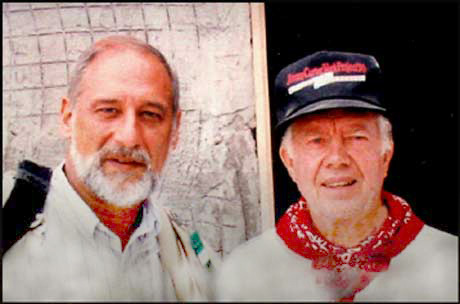 My mission was to see if I could get an interview with Jimmy Carter, who, along with Rosalyn, was camping in a tent and working several days for H for H, with which he had some participation in founding. I was doing radio documentaries for KPBS-FM, the NPR Public Radio affiliate in San Diego, and this was, as they say, right up my alley, a piece that really fit my program, Metropolitan Journal. Volunteers from around the country and foreign countries as well, were working alongside local Mexican families and an ex-president of the United States, to assemble 100 or so 850 sq. ft, partially pre-fabricated homes on a muddy hillside. There is not a phony bone in Jimmy Carter, or in wife Rosalyn, who came by holding a little Mexican girl, with several more in tow, from the nursery where she works tending the kids of the working parents. They did their interviews without any self-promotion or agenda other than endorsing the project with their presence. If Jimmy hadn’t been “blessed” with a major oil crisis and the Iran Hostage crisis we might not have ended up with that Reagan “October Surprise,” that “morning in America” malarkey that falls out of the butts of bulls, Iran-Contra, and the biggest deficit until the current phony came into office. The rest of my program* is composed from interviews with the volunteers who were working alongside the locals. Although H for H is what would be called a “faith-based” organization there was no discernable in-your-face Christian stuff evident as I moved among the houses. There were two middle-aged women from northern California on one house, using their limited Spanish while working alongside the locals; a dancer from Wales, and her Black tent-mate from London on another house; a young guy named Klaus all the way from Frankfort, Germany. These people weren’t getting anything but fed; they weren’t asking for those nice fat Halliburton and KBR salaries, or the six figures that that the bodyguards get paid to keep Bush administration sycophants alive when they race from the green zone to the airport. Then there was this little bantamweight from New York, named Johnny Gallo, a wiry, tough stonemason who retired to travel around volunteering for H for H projects. Like the rest of the volunteers on this project Johnny wasn’t a phony and, as far as I could tell, wasn’t there for any other reason than to give, as he put it, “something back” for his own rising out of poverty. Who knows, Johnny may be down in New Orleans, or Mississippi, working on a project. If he is, he’ll counterbalance that phony from Crawford, Texas. *”Habitat for Humanity: Tijuana,” aired in KPBS-FM Morning Edition , June 29, 1990. One of these days, when I figure out how to get my audiotapes digitized, these programs will be available for listening on the UrbisMedia site.